TL;DR: Read just the bold text to get an overview. Here we are, the evening before the new year starts. This marks the 10th year that this site has existed for. This site is now a decade old! This site and the growing community it entails has been on my mind a lot lately. We've been through a lot together. The end of the year is a good time to take a look back at where you've come from and where you'd like to go. I tend to get a little pensive and introspective at the dusk of one year and the dawn of the next. I know I'm not alone in that. I want to share my current thoughts with you, my readers and friends, on where we've come over the last year, and a vision of the future — or at least a potential vision of the future — for the upcoming year. That's what this is: my thoughts on the current State of the Site, both in terms of what has transpired over the last 366 days, and what we might be able to accomplish together over the next 365 days. I'm intentionally trying to be transparent with my thoughts. Not everything that follows is positive. But having said that, I am very excited about what lies ahead of us. Let's recap some of the big things that did happen over the last year—good and bad. We had three competitions in 2016. Participation in them was steady, and I think everybody who participated gained a lot of useful knowledge and experience. We've even had one person (Brett) take a game he made in the competitions and actually got it published. I hope to see more of that in the future with the competitions. Competition 7 technically started in 2015, and ran from mid-December to the end of January. This was the first time we explored a competition length besides the 31-day competitions. This competition included 3 different games with 5 different people. Competition 9 ran from mid-November to mid-December. This one had 3 total projects by 3 people. This was a return to our more standard month-long competitions, after having been away from it for a year. I won't speak for everybody here in this next part. I think other people were able to get far more done than me. But from my perspective, I was disappointed in myself and what I completed in the competitions over the last year. In both Competition 7 and Competition 8, work got extremely busy, and the game dev project got dropped. Competition 9 was probably the single best one for me. 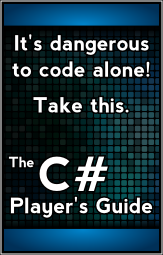 I had two projects: a game dev project with PiscesMike and updating my C# Player's Guide book. And naturally, stuff happened (the impending release of Visual Studio 2017) and the game mostly fell by the wayside. On the bright side, I was able to make a lot of progress on the 3rd edition of my book during Competition 9 and the time since. But the bottom line is that I have no new gamesnot even any new partial or playable gamesas a result of the competitions. More on that later. We also held two collaborations during the year. Collabs are a single day where many of us get together (digitally, not physically) and work on a single game, attempting to knock it out in a single day. Our collaborations in 2016 have been valuable as well. We were able to do some interesting things as a group. I do think that our collabs can be made even more useful though. We've also been pushing our limits in terms of how many people we can actually support in a single game. Future plans will probably need to account for contingency plans of splitting up into multiple groups. Collab #5 took place on April 16th. We took the Xevious game we had made in an earlier competition and added 3D rendering and a variety of multiplayer modes. This was very successful. It all managed to come together pretty well towards the end. Collab #6 happened on the 22nd of October. We remade Blockade from scratch. This actually goes a long way in illustrating how far we've come as a group, because this was the same game we did for the first Collab a few years back. In addition to the core game, we also got a menu up and running, multi-round play, and a bit of networking. One particularly noteworthy thing about this collab is that we hit our 5-person limit in the repository for the first time. This was the most popular collab we've done to-date. One of the most significant events of the year was when we moved our chat room from IRC to Discord. We've been using IRC for a number of years, but switching to Discord got us a number of nice features: multiple channels, audio chat, persistent chat history, syntax highlighting in the code, and just a generally better look-and-feel. And our chat room numbers have been growing! We've now gone from about 10 active people when we made the switch to over 20 in just a couple of months. The growth has been fun to watch, and the influx of fresh blood and new ideas has been valuable. I'm going to avoid giving concrete numbers in terms of how many people visit the site. Instead, I'll present them in User Points and Page Points, which correlates to actual user and page load counts, but by some multiplier that is known only to me. At the site's visitor/page load peak in 2013, there was 155 Page Points and 44 User Points. In 2016, that has slowly dropped to 73 Page Points and 27 User Points. It's a rather significant drop. Fewer people have been arriving at the site over the last year. Keep in mind, it's still a lot, but less than it used to be. The reason for this is likely two-fold. 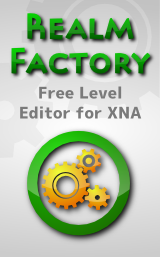 First, the site was originally built around XNA, and XNA was retired in early 2013. While I've tried to port everything over to MonoGame, I still (yes, after all these years) have a long way to go. Most of the content is the same, but none of that has been verified nor formalized for probably 60% of the tutorials. Second, because I haven't been adding new tutorials, the site has dropped in Google search results. The overwhelming majority of traffic comes directly from Google (or from repeat visitors). So this makes a difference. The content on the site is great, but the last year has seen very little new tutorial writing, and only minor changes to existing content. We've focused a lot on the competitions and collabs, and to a large degree, I've inadvertently let the content that brings people to the site languish. The site is due for new content, and lots of it. It is also due for some UI redesign to allow for more responsive design. It might even be due to be moved off of Wikidot and into a system that allows for far greater expansion in the future. But let's not get too far ahead of ourselves. I'll admit that looking back, things don't feel too exciting. That "stagnation" word keeps popping into my brain. But I think the future is far brighter. So for the rest of this article, I'm going to focus on that. I have great plans for the site that should help to reinvigorate it and start to take it in directions that we've never seen before. The rest of this article contains five high level objectives for the upcoming year, as well as three personal goals of my own that dovetail into the site pretty heavily. The first thing I'm going to be doing is scheduling a time for us to talk about and decide on a schedule for competitions and collabs for the whole year. This would theoretically be used as a template for future years. The plan is to find an arrangement for three competitions and three collabs. I'll probably be aiming for two 30 day competitions and one 100-day competition. The purpose of this is to make it clear well in advance when these events are happening. This allows people to plan ahead. Take time off of work if needed. And generally know the plan so that they can start planning their games at the appropriate time. We've now done 9 competitions and 6 collaborations. They've all generally followed the same pattern. I can't help but feel that as nice as the competitions and collabs are, we can probably get more out of them. So the second thing I'm going to be doing is organizing a time for us to have a retrospective meeting to talk about what is working and what should be changed, and explore ways to shake it up or make it more interesting. I have plenty of my own ideas on this, but I think it will be even better to get more perspectives. I'm sure you've had your own thoughts about the competitions and collabs. I want to hear them. I think as a group, we can find a way to make these even better and more useful than they have been in the past. My dream would be that everybody who participates in all three competitions would have a shippable game at the end of the year. Let's figure out how to make the competitions and collabs a useful tool in accomplishing that. One of the things I really want to have happen with this website is to broaden it so that it's not just for game developers. The single biggest group of people that this includes is the artists. Furthermore, I know there are programmers here who have been doing their own art for their games and want to get better at it, or others who would be OK doing the art themselves but just don't feel like they're very good and don't know how to get better at it. So far, all of the content is really geared at programmers. There is a good, useful "track" for programmers, but not one for anybody else. I don't profess to be an artist. This is an area that having some help would be very beneficial. But expect to see over the next few months a great amount of discussion and organizing with the goal of producing value here for artists (or programmers that want to get a little better at the art). Making this a site that is also interesting to game artists, not just programmers, could also help spice up the competitions and collaborations as well. At a minimum, it is one of my personal goals for 2017 is to get better at the art side of things. If I can drag any of you along with me, then that's even better. If this is something that is of interest to you, then we should talk. As I mentioned earlier, one of my personal biggest failures with this site in 2016 is the stagnation of tutorials. That will change in 2017. You will be seeing more new tutorials (and a few revised and updated existing tutorials) over the next year. I won't make any promises for what specifically will get added or modified. I won't commit (publicly) to any specific number of tutorials just yet. But do expect motion in this area. And if you have something specific in mind that you'd like to see, I want to know about it. In addition to the game dev and game art, I think our growing community would stand to benefit from getting together and discussing specific games. Each month, we pick a game. (Perhaps something like a loot crate style thing—maybe Humble Monthly Bundle.) Everybody in the group is expected to play for a set amount of time, and then possibly do some other digging or studying about the game or some specific aspect of the game. We'd then get together near the end of the month and talk about it. The goal here is to produce a group that can not only learn from each other, but from deep, thoughtful analysis of games actually on the market, and improve our own thought processes, strategies, and skills as a result of what we learn. I'll admit, this particular item is the most likely to fall off the radar in 2017. I'm not going to push this one if I'm the only one interested. Shifting gears slightly, I want to talk about my personal goals for 2017. I know that this is not entirely on-topic for a post about this site. But I'm going to do it anyway. Obviously one of my personal goals for the upcoming year is all of the work that it will take to make the above items happen. I want help from others in the community, but each of those items will take up a fair chunk of my time. Updating my book to the 3rd Edition to keep up with Visual Studio 2017 and C# 7 is my first major personal project of the year. Visual Studio 2017 is getting released very soon. I've been updating my book for Visual Studio 2017 and C# 7. I still have a long way to go, but I'm working my way towards the finish line. This book has been one of my proudest accomplishments. I'm very happy I wrote it. It's a great resume booster, and I can't count the number of things I've learned in order to write it. I love the responses I get from readers about how much it has helped them. Plus, the small amount of cash that I earn from it pays for this site and supports other activities related to my own personal game development journey. Thank you to all of you who have bought my book. I hope I've helped you learn C#. And I look forward to helping even more people with the 3rd edition. Having said that, I don't want to be limited to just my C# book. I plan on expanding and producing other books. The C# Monster Manual, which covers the most useful core .NET types, topics, and tasks in the BCL. Perhaps alternatively, instead of another book, I may produce some of this content in the form of an online course. Possibly through Udemy or something like that. The point here is to produce a second, separate source of information, and a second revenue stream for myself. Diversifying my personal projects is the overarching goal. I've felt, for a very long time, that the fact that I haven't published a game yet is a rather large black mark for me. I've made a lot of games for fun. Or stated differently, I've made 80% of a lot of games for fun. I've made a lot of non-game software that has sold (my day job). I consider myself a great programmer, and very knowledgeable about game development, but I'm not thrilled with the fact that I've never taken a game project from scratch to the finish line. And that is going to change in 2017. I'm not going to make grand promises of delivering a game every month or anything crazy like that. You can probably tell from this list that I'm not going to have time for that at all. But I do want to be able to have the joy of having a shipped game under my belt when 2017 closes a year from now. 2017 will be the Year of the Shipped Title for me. I'm very excited about the future for this site, and for this little growing community. I want to make game development fun and exciting for everybody who attempts to take that journey. It's not an easy task. Game development is the pinnacle of software development. It combines all of the hardest parts of every other application—graphics, networking, databases, optimization, sophisticated data structures, UI, User Experience, and on and on. Game development pushes all of us to our limits, and that's why I love it so much. I hope this gives you some insight into where we're headed here. I'm looking forward to becoming a better game developer with you over the next year. Thank you for the wonderful 2016, and here's to a 2017 that can take us all to the next level!